These scintillation detector instruments are primarily used in a fixed laboratory setting or in the field, mounted in a weatherproof apparatus, to perform a well defined purpose. Additional instruments, such as a computer or power supply may be required for operation. 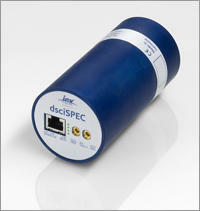 The dsciSPEC is a high performance, digital, scintillation spectrometer housed in a 14-pin tube base. Everything required to operate a scintillation detector, from high voltage supply to ADC and memory, are included in this compact instrument. RJ-45 Ethernet interface using PoE for operating power. The scintiSPEC is a universal MCA for 14 pin scintillation detector spectroscopy and counting with a USB interface for communications and operating power. Copyright 2005-2011 theglobalquality.com All rights reserved.